Christmas Without Christ Just Isn’t For Me! 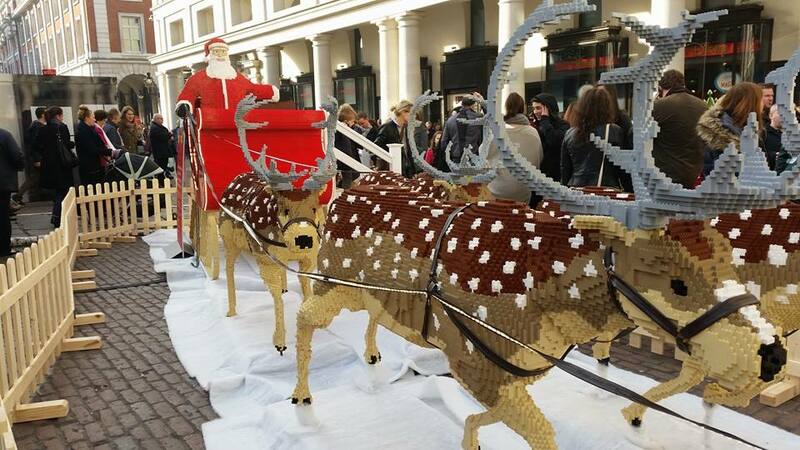 Lego Santa at Covent Garden, London, would be pointless without Christ’s birthday. The dictionary definition of an atheist is someone who believes that God does not exist, but on this first Sunday of Advent 2014, it is far easier for me to believe that God does exist than he doesn’t. How can you look at the fantastic glow of a brilliant sunset and not feel a divine touch in your inner most being? How can you glance at the beauty and innocence of a child’s face and not see God’s hand upon them? A rainbow, a powerful storm, a beautiful flower each spell out to me the existence of a being much bigger and more powerful than me. ‘The heavens declare the glory of God; the skies proclaim the work of his hands.’ Psalm 19:1. I am loved by God, ransomed by Jesus, supported by the Holy Spirit and provided for in every way. I commit my day, my work, my life and my family to Him. He never lets me down, even when I fail. Christmas without Christ is as empty as the ringing of a cash till and as futile as fire without heat and smoke. I would rather live my life believing in God and risk being proven wrong than live my life not believing and suffer the consequences when I meet Him face to face. The question is, would you? This entry was posted in Challenges, Christian, Encouraging, Nature and tagged Atheism, Christmas, God exists, Psalm 19:1. Bookmark the permalink. lives. So can you. Happy Christmas. Translation: You don’t take atheism seriously. If and when you do, then perhaps you’ll have something interesting to say about it. Couple of thoughts. You are aware that before Christianity, the holiday we now call Christmas existed, right? Also according to the Biblical narrative the period of Jesus birth was not December, but sometime in spring. Second, an atheist is one who has no belief in god, not just someone who believes there is no god. There is a difference, the later is the broader of the two definitions and is more accurate because it encompasses the former. Just an FYI, if you are going to discuss atheism, we prefer the broader definition. 2.”How can you glance at the beauty and innocence of a child’s face and not see God’s hand upon them?” Evolution and biology, basically we find children adorable and innocent, because of the symmetry of their faces, which causes us to want to not leave them in the elements, so our species continues. This is called the Disney effect. We see innocence, because a child is a blank slate, until through education and repetition, as well as life experience the person becomes full of the environmental programing they’ve received over time. 3.”A rainbow, a powerful storm, a beautiful flower each spell out to me the existence of a being much bigger and more powerful than me.” This isn’t so much a question as clearly a statement of belief. I.e. Because I believe in a being larger than myself I see evidence of its agency in the world. We can both look at the environment around us and see power greater than our own. The difference is you make a huge assumption, that what you see supports your presupposition. Instead, I look at a rainbow and see an example of the light spectrum, a storm is an example of whether patterns, a flower a product of evolution over thousands of years of selective breeding. For this to be evidence of a being and consciousness one would have to show support for this claim. The evidence we see about the universe indicates much the opposite, that the development of all biological life on this planet is a process of unconscious evolution in response to environmental factors. You end with a regurgitation of Pascal’s wager. I wonder how do you know you have chosen the right god? Did you grow up a Christian or are you a convert? What happens if you find out you are right about god, but wrong about hell? Pascal’s wager is based upon the threat of hell, it’s only valuable if you believe in hell and sin. If you don’t it doesn’t create the same justification for belief. There are literally thousand’s of gods, yours is just one version of a large grouping of slightly different concepts that are generally similar. Take Jehova’s witnesses, who don’t celebrate christmas, believe in Jesus and hold that belief is not enough to guarantee a spot in heaven. You could be partially right, but not completely right. How do you know? Second paragraph should be switched. the later definition, which you used is the more narrow of the two definitions. I.e. an atheist is more correctly defined as one who has no belief in god, rather than one who believes there is no god. in experience that each one of us have or will have in the future. If God dose not exist then you will never know, but if he dose you will certainly know the truth of which non believers have had as their “faith” for so much of their lives. My experiences tell me that God and Jesus is/are for real. Certainly, if god does not exist I will receive no punishment or blessing for my lack of belief. If god as you define him does exist I will undoubtedly be punished for my lack of faith. Since the evidence I observe and my experiences in life indicate a lack of support for your god claim, I’m pretty secure in the basis for my lack of belief. However, there exists a distinct possibility that we are both wrong and will receive punishment for our lack of faith in the right god. What specific experiences are those that you describe? If evidence for god is based upon subjective experience how do you determine if you are in fact correct, about your hypothesis? Have you gone out to test the extent of your beliefs and determine whether your belief are based upon evidence or whether the evidence you perceive is based upon a presupposition? If presented with evidence would you change your belief? The post’s original author establishes natural occurrences which are explainable without the existence of god as conclusive evidence that her god exists. This claim supports her presupposition that god exists rather than that there could be an explanation that doesn’t rely on the presupposition of god which gives answers for why those things occur. Further, we non believers don’t hold a position on faith, this is a misunderstanding of what faith is and why we hold the beliefs we do. Specifically, we hold our beliefs based upon evidence and our understanding of the natural world, as well as the logical implications of god claims. When show evidence that supports a claim different than our own we look at that evidence. This is why most of us are incredibly well versed in at least the predominant religion in our region as well s others. An atheist is one who says I don not believe in god(s), this is not a statement of belief lacking evidence or held in the face of contradictory evidence. Rather it is a state of unbelief about a claim, usually held because the weight of the evidence provided is insufficient to convince this individual of the god hypothesis being presented. Since atheism in general makes only makes a claim about an individuals state of belief, or absence of belief in god(s). It isn’t a statement of faith, which is a belief held in the absence or in the face of contradictory evidence. You as a Christian don’t have faith in Thor or Zeus, Odin, Bal, El, etc. Your lack of belief in these deities while stemming from your faith in Jesus, is not reliant upon that faith to justify your lack of belief in others. Instead your lack of faith in these gods is based upon an absence of conclusive objective proof to convince you of their existence and power. So basically you would rather live in fear than risk going to hell? Do you believe that a god cannot see what your motivation is? Your god of love is so angry that you live in fear? What good account can you give of your faith if it is simply based on fear of hell? If your pozt was meant to inspire then it is these questions that it inspired.